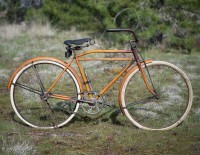 Welcome to Dave’s Vintage Bicycles! Choose your favorite bicycle brand from the list above, or check out the Pre-War, Post-War and Antique categories to see hundreds of interesting old bicycles! This is a very rare Miami Cycle & Mfg. Co. built 1919* Flying Merkel “Motorbike” bicycle. It’s an un-restored survivor with original paint intact. The trademark “Merkel Orange” is accentuated with maroon head and gold pinstripes. It features the motorbike style frame with truss fork, Persons leather saddle, cross brace handlebars and of course, a Miami built….